Discussion in 'Vaping General Chat' started by cerebral79, Apr 4, 2014. Today my copper Nemesis clone by HCigar arrived in the mail. I wanted to try this mod out because I saw a few videos that showed tests between this one and a steel one where the copper caused less of a volt drop off from the battery, resulting in a harder hit. Unlike my steel one, this one feels a lot beefier, and the button feel more sturdy. I took a few of the steel parts from my other model and added them to the copper one to get a nice two tone look going. I have some copper drip tips coming soon which will round out the two tone look. 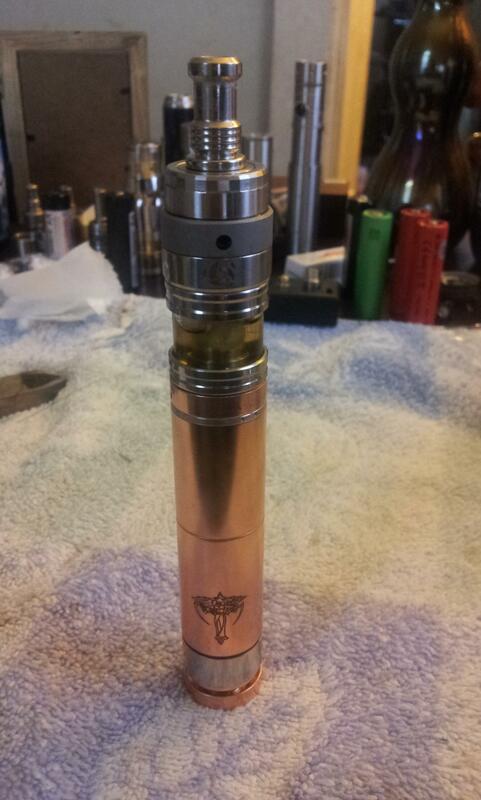 That tank on top is the Helios RTA (Rebuild-able Tank Atomizer) Clone. This combo is a beast and makes for a great vape experience. I would recommend this nemesis to anyone that is used to mechanical mods, i know I am enjoying it. Oh on a side note, a patina will form which can look cool but if you prefer the shiny copper look, you can pick up some copper polish and get it back to the original shine. Why are these things called clones? Are they not the real thing? Or is there some other reason? Yeah it's basically a direct copy, which as far as I know makes them about as good as the real thing. There's Nemesis "styled" mods as well which may or may not be worse as the real thing. yep you got it, clone is just a copy and its weird some of these chinese companies like HCigar are actually making clones that are being cloned by other companies because they are so high quality lol. Don't get me wrong, if I had a couple hundred bucks to spend on each of these mods and RDAs to test them I would but I just don't. The clones let me get a feel for which one I want to seek out a legit one for. So far I prefer the Atomic RDA and the Kraken Rebuildable tank and of course I would kill to get my hands on a legit Nemesis mod but I really love the copper one and the guy who made the original Nemesis didn't make a copper version, so with the exception that HCigar ripped off the Nemesis creators logo and markings its kind of not really a clone. I just wish HCigar would have created a copper mod taking some of the better "ideas" from the nemesis and made something new but i guess that's neither here nor there. Ultimately, if you see an awesome tank/RDA/mod that you like but it costs over 100 dollars, search for a clone, test it out, and know that the original is in most cases better quality and then decide if your vape budget is worthy of adding it to the potential buy list. P.S. I used to be anti clone 100% but now i've given in a bit because I am only purchasing them to ultimately find the perfect legit parts to buy. :mrgreen: It's so pretty! Where did you find this bad boy at and for how much? Thanks! 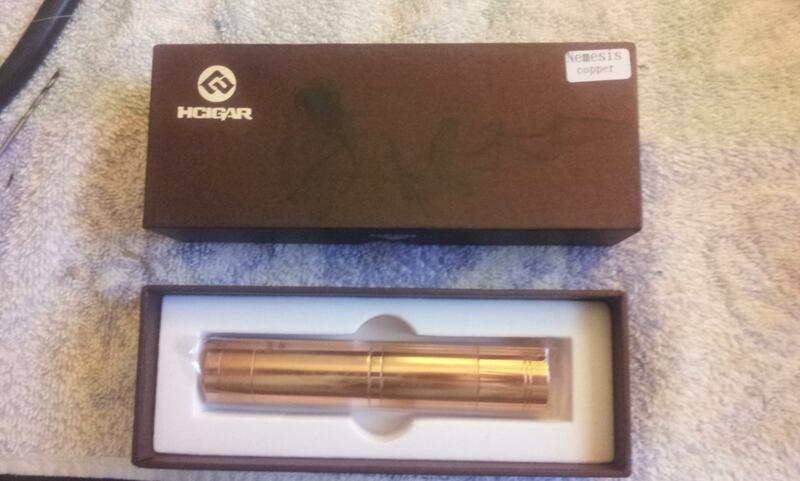 I actually got this one off of ebay, I just searched "copper nemesis" and looked for one by HCigar. They are around 35-40 bucks usd typically.